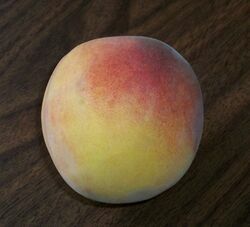 A peach is the popular fruit produced by the tree Prunus persica. Peaches were first cultivated in China, where they are a symbol of health and long life. Cultivation spread along the Silk Road to reach Europe by the time of the classical Greeks. Today, peaches are grown throughout the temperate zones of the world. Peach trees can be grown in most kinds of soil if fertilizer is added, but are best in well-drained loams. They require a chilly but not severe winter (no lower than -10 to -15°F) to trigger growth after the dormant period, and a warm spring for flowering. Fruits develop only on one-year-old wood, so the trees must be pruned to allow the constant production of new branches. Because of this need to constantly develop new shoots, peach trees tend to be shorter-lived than other fruit trees, with some varieties lasting only 8 to 10 years. Each fruit develops from a fertilized ovary, of which only one ovule usually develops into a seed. The seed is enclosed by a hard covering called the pit or stone, which in turn is surrounded by the edible flesh of the fruit. Peaches are grown exclusively for human consumption. The fruits are grouped into two categories: freestone, where the pit is easy to separate from the flesh, and cling, where it is not. Cling peaches are used primarily for canning because they hold their shape better, and freestones are preferred for cooking because they are easier to work with. Peaches can be eaten raw, either directly or in salads. Cooked, they are used in desserts, relishes, and preserves. This page was last modified 17:45, 11 June 2009.